Zurich is simply enchanting during the advent period, with quaint Christmas markets, traditional advent concerts and impressive Christmas shows. The key information at a glance: Zurich’s magical Christmas illuminations are marked in red, while the blue stars show where the city’s most beautiful Christmas markets are to be found. The Christmas market at Zurich main station is Europe’s largest covered market. The centerpiece is a 15 meter high Christmas tree, literally dripping with Swarovski crystals. The Christmas village at Sechseläutenplatz is many residents’ favorite market. An adorable and quaint hive of activity, reminiscent of Santa’s fabled home in the North Pole. During Advent, the city by the Limmat is bathed in magical light: the ‘Lucy’ Christmas lights on Bahnhofstrasse and countless fairy lights twinkle throughout the Old Town from the end of November. Rennweg near Bahnhofstrasse is particularly enchanting. The lights resemble falling snow and captivate the passers-by. The very picturesque Augustinergasse is even more handsome dressed in its Advent garb. The tree-like illuminations along Limmatquai make a stroll through Zurich’s Old Town even more romantic. Switzerland’s first Christmas circus entertains young and old with its acrobatic feats. The circus has been a permanent fixture of Advent in Zurich for more than 30 years. The Lichterschwimmen floating candles event is organized by Zürich Tourism and the School and Sports Department of the City of Zurich as a Christmas gift to all residents and visitors. The oldest Christmas market in the city is in ‘Niederdörfli’, in Zurich’s Old Town. Zurich’s public candle-making event – during which young and old can create their own candles out of pleasantly smelling beeswax – is for many locals just as much a part of Christmas as Christmas tree decorations are for others. The Märlitram has been chauffeuring children around Zurich’s city center since 1958. During the trip, two angels recite Christmas stories. Combine all the ingredients in a saucepan and heat up slowly. Be careful not to boil the wine, otherwise the alcohol will evaporate. Constantly stir and taste the glühwein. In this way, you can immediately taste if any of the spices is too dominant. If this is the case, remove immediately. Serve at a temperature of around 60 °C. The singing Christmas tree at Werdmühleplatz Christmas market delights visitors year after year. Ice skating is especially popular at Christmas. Zurich’s three most beautiful rinks stand in a forest, by the lake and in front of the opera house. A cup of hot chocolate or a glass of mulled wine taste even better here. At the Christmas village against the spectacular backdrop of the Opera House an ice rink invites ice-skating enthusiasts of all ages to perform some pirouettes. Lovers prefer the romantic ice skating rink in Küsnacht. They perform the most wonderful pirouettes at the Romantik Seehotel Sonne in Küsnacht, right next to Lake Zurich. The Dolder ice skating rink was built high above the city in 1930. The picturesque skating rink is reached through a small forest and also offers curling. 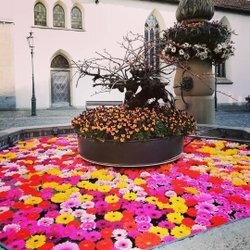 The ‘Christkindlimärt’ in Rapperswil is particularly charming. Children adore these lovingly decorated little cabins in the heart of the city. The Winterthur Christmas market in the center of the Old Town is especially picturesque, thanks to its unique historic surroundings. Advent wouldn’t be Advent without cheese fondue. The locals are particularly creative when it comes to fondue, hosting their parties in trams, eTukTuks and by the river. Fondue enthusiasts can wind their way through Zurich’s city center on board a historic tram, enjoying Switzerland’s classic cheese dish and homemade mulled wine. During this quirky city tour, guests feast on fondue inside an eTukTuk as it putters past Zurich’s main attractions. Of course you can also enjoy your fondue in more classic surroundings, such as the comfortable Wirtschaft Degenried. The Dada art movement began in Zurich. Today, you can still find traces of Dadaism throughout the city. In the summertime, Zurich is a city pulsing with concerts, bars, cinemas and open-air parties. The most beautiful Swiss mountains and cities are just a few hours from Zurich. 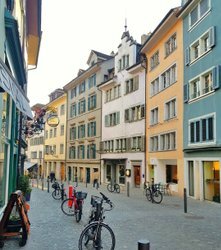 Zurich’s characteristic streets, corners, squares and buildings have many exciting stories to tell. Zurich boasts the highest density of clubs in Europe and the most diverse nightlife in Switzerland. Discover Zurich in winter and find out everything you need to know about nearby ski areas, wellness and shopping in the cold months of the year. Get to know the Water City of Zurich and find out the impact that water has on the city and its inhabitants. The Grand Tour of Switzerland takes you on an automobile trip through the whole of Switzerland. 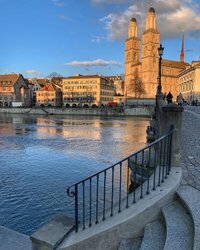 Discover the most important sites of the Reformation in Zurich and be inspired to embark on a tour of discovery through Zwingli’s city.